One of the programs NAWA is commited to (and is proud of) is charity, aimed at helping some of the less fortunate in Budapest as well as other worthwhile causes such as Semmelweis Oncology Department. The resources utilized are a combination of NAWA members giving their time to assist with some of the NAWA organized charity activities, as well as funds that come partially from membership fees, as well as other charity donations, such as our monthly charity book sales table at the NAWA General Meetings. cSurviving & Thriving: A Guide to Living in Budapest (S&T). cNAWA ladies living here in Budapest. donations would not – love and attention. 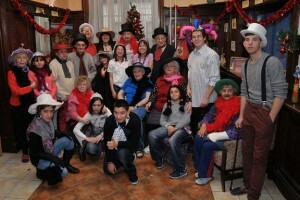 The events are planned in a setting where seniors and orphans can interact and form bonds – the aquarium, the zoo, the circus, a meal at McDonald’s (a very special treat for them), a visit to the Parliament, Christmas arts and crafts, Easter egg painting, Grandparents/Grandchildren Day celebrations, painting ceramics, and our most popular event, BINGO! Since the program started more than fifteen years ago, the most wonderful thing to see has been the long lasting relationships that have developed between the seniors and the children – special bonds that make them feel that someone really cares. 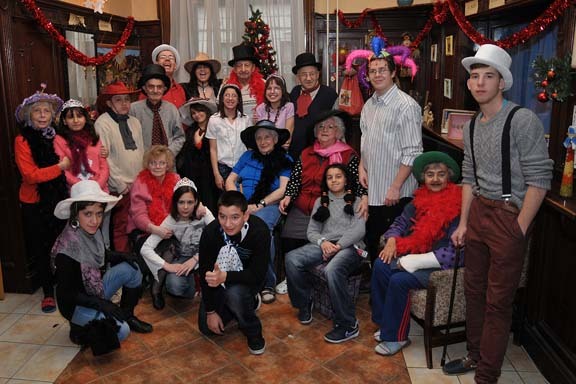 These events can be fun for everybody, but for our group of orphans accompanied by their “adoptive grandparents” (residents from an old age home), these are rare moments of excitement, fun, joy, attention and affection. At NAWA’s November general meeting, members will prepare gift bags which, with the help of NAWA volunteers will be distributed in early December to 200 residents of two senior homes and 100 children from one orphanage. These volunteers, dressed up as Santa and her elves, will carol through the hallways of the senior’s and children’s homes. The smiles and sparkle in the eyes of the seniors and the children is all you need to know how much this means to them. All are welcome and we would appreciate as many helpers as possible to make it a fun experience for both the children and the elderly. This is one occasion that everyone looks forward to. For more details see Events and the Weekly NAWA Members Announcements. Monies from fundraising events are allocated towards special charities that are decided upon annually. The choice of charity from the proceeds of fundraisers will be decided by NAWA. In order to meet the needs of our membership, NAWA Charity has looked into extending and adding variety to our programs. There are many worthy causes here in Hungary and the Salvation Army works to bridge the gap between the needs of the community and those of the local governments. While providing support to the needy they also teach and encourage members of the local community to continue this work. In the 6th district (Terezvaros Community), the Salvation Army manages The House of New Beginnings, a shelter and transitional home for women who need help with re-integrating into society and the workforce or with placement into other social programs. At this location, they also run a daytime warm-up facility and community kitchen for 50-60 homeless people daily, as well as overnight accommodation for 24, during the winter months. The headquarters of the Salvation Army Budapest is also located here. Also in the 17th district (Rakosliget Community) the Mothers’ Home provides refuge and a transitional home to women and their children from abusive homes. Here the situation is quite fluid, consequently there is a continual need for donations of clothing (women and children), toys and toiletries. We are trying to organize activities that are fun and educational for the mothers and their children, like the muffin baking afternoon enjoyed by all participants just recently. We could also help by providing babysitting on the weekend so that the mothers (who generally work during the week) can do their assigned chores without having to worry about the children. NAWA does not, typically organize week-end activities as this is a time dedicated to our families but the occasional Saturday afternoon (a time preferred by the working mothers at the House of Light) could be turned into valuable family time, when our own children learn empathy, compassion, sharing and interacting with less fortunate children. We will keep you posted in our general meetings, weekly newsletter and in Events. For any additional information, please contact nawacharity@gmail.com. *Address not provided on our website for security considerations but will be provided to volunteers and donors as needed. The Men’s Hostel in the 8th district (Jozsefvaros Community) is located quite close to the downtown core and could use donations of non-perishable food, men’s clothing, shoes, boots, scarves, hats and toiletries. Volunteers would also be most appreciated to help serve the noon meal provided daily for the needy and tidy up in the dining room afterwards, particularly on weekends end especially on Sundays. NAWA could organize a roster for anyone interested in helping to hand out soup and bread to the homeless at Keleti station on Thursday afternoons from 4pm. This usually takes about 30 minutes to an hour and is a combined effort of the Men’s Hostel and the local Salvation Army church. Donations are gratefully accepted Mon-Fri, 9:00 AM to 5:00 PM. Please call at the gate inter-phone and say the words “NAWA donation” and an officer will come to the gate to assist you. All donations dropped off at the head office are sorted and distributed among all the Salvation Army institutions. Should any of the other institutions/locations mentioned above be more convenient for you, do not hesitate to bring your donation there. Exceptionally, on designated dates twice/year, we will collect donations at our general meetings, to be picked up by the Salvation Army. Please watch for information on our Facebook page, in our weekly announcements and in Events. If you wish to donate a large amount of goods, which you cannot transport yourself (in case of moving, de-cluttering or re-organizing your home), please contact nawacharity@gmail.com and we will arrange for your donation to be picked up from your home. Join us! Share! Bring smiles of joy to seniors, orphans and all who need it, and share the good times with NAWA friends. 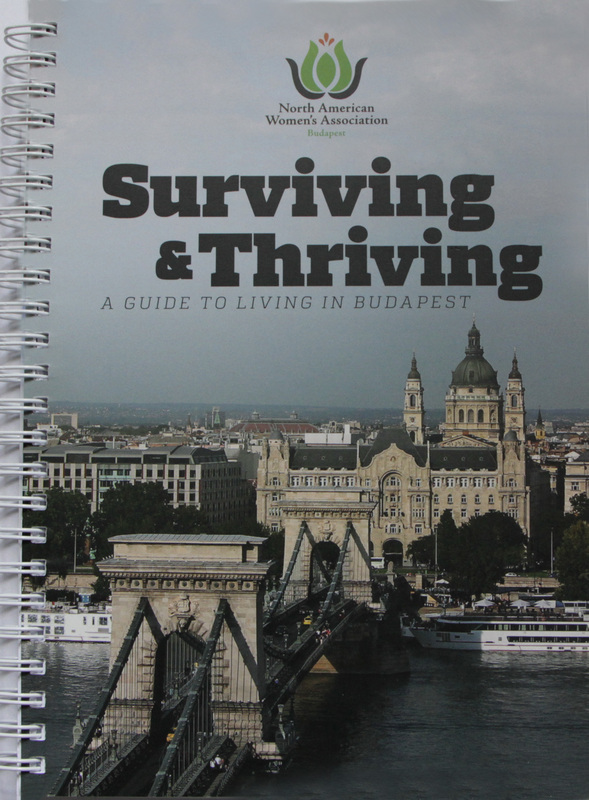 NAWA’s Surviving & Thriving: A Guide to Living in Budapest (S&T) is a perfect gift and 100% of proceeds go towards funding NAWA’s charities right here in Budapest.